Thunderheart (1992) was fabulously directed by Michael Apted against the stunning South Dakota backdrop. It’s a powerful screenplay by John Fusco, who skillfully shows the mistrust and animosity that has embodied the relationship between Indian Country and law enforcement. 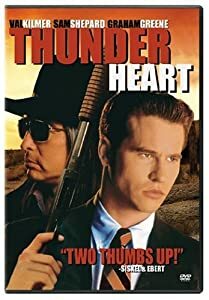 Val Kilmer is Ray Levoi, a mixed Sioux FBI agent, who is tasked to investigate a reservation murder, alongside fellow agent Frank Coutelle (Sam Shepard). Levoi soon learns that off-nation investigation tactics don’t work here. While his supervisors think he can use his mixed blood to cement a solution, in reality, he finds that it creates even more distrust among the Sioux. As he faces more encounters with Walter Crow Horse (Graham Greene), who introduces him to Elder Grandpa Sam Reaches (Ted Thin Elk), they begin to work together when it appears there is more than this single murder at stake, especially when Levoi is at odds with the behavioral overreach of his fellow law enforcement officers. Maggie Eagle Bear (Sheila Tousey) and Richard Yellow Hawk (Julius Drum) also step in to help solve the mysteries around this investigation. The reckless disregard for native lives is even more powerful because it is based on actual events. This movie scores four and a half stars out of five. This entry was posted in Drama, Michael Apted, movie review, movies, mystery suspense, race relations, Sam Shepard, Val Kilmer and tagged crime drama, debbie elicksen, FBI, Fred Ward, Graham Greene, Indian Country, jennifer miller-bender, John Fusco, Michael Apted, movie review, movies, murder, mystery, our movie talk, reservation, Sam Shepard, Sioux, Thunderheart, Val Kilmer by admin. Bookmark the permalink.